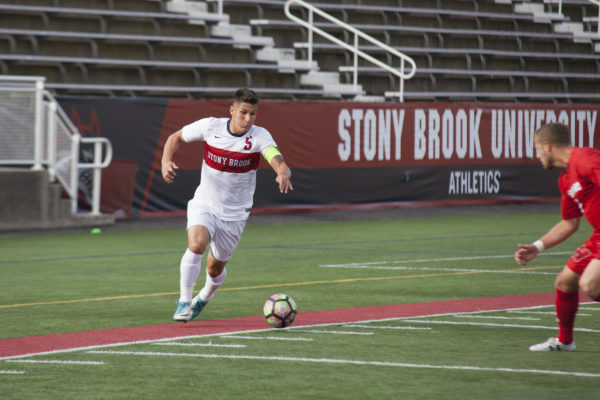 The Stony Brook men’s soccer team continued its downward spiral into the America East standings after falling 2-0 to No. 19 New Hampshire Saturday night at Wildcat Stadium in Durham, New Hampshire. The Seawolves have a 0-3-2 America East record and have not won a game since scoring a season-high four goals in a 4-1 victory over Sacred Heart at Kenneth P. LaValle Stadium on Oct. 3. Despite losing the game, Stony Brook was able to hold its own against its nationally-ranked opponent. The team kept New Hampshire off the board in the first half despite allowing six corner kicks and being outshot 5-3. Wildcats graduate forward Robin Schmidt scored two goals against the Seawolves on Saturday night. He scored his first goal after receiving a cross from junior midfielder Alex Valencia in the 67th minute, sliding on the turf to poke the ball past the diving, outstretched hand of Seawolves sophomore goalkeeper Jacob Braham for the goal. The second goal came off Schmidt’s foot with just under one minute to go in the match. Wildcats sophomore forward Jack Doherty cleared the ball from the New Hampshire half of the field and sent the ball into the middle of the field. Schmidt was able to race past the Stony Brook defenders to get the ball. The forward beat Braham off the dribble and calmly placed the ball into the side netting for the 2-0 lead. Right as the Seawolves kicked off with hopes to start a comeback, the buzzer sounded and the game was over. Saturday’s game was Braham’s eighth straight start on goal for Stony Brook. He has started over redshirt-senior goalkeeper Tom McMahon, who has been dealing with a leg injury he suffered back in the second half of a 1-0 win over Bryant on Sept. 16. Braham has a 1.20 goals-against-average and has recorded 37 saves in that span. However, his overall record does not back up his individual stats. The Seawolves have won one game in which the sophomore goalkeeper started. The team holds a 1-4-3 record this season with Braham in the net, while posting a 5-1-1 record with McMahon as the starter. Stony Brook has two more games left in the season, with the chance of making the America East Conference playoffs very slim. With four of the six playoff spots locked down by Albany, UMass Lowell, New Hampshire and Vermont, the team would need to win their next two games and hope the teams in front of them in the standing, UMBC and Binghamton, lose their next two games as well. The team will return home to celebrate Senior Day before its final home season game, where it will take on conference rival Albany at LaValle Stadium on Saturday, Oct. 28 at 7 p.m.